More than a third of respondents still haven't made a final choice. 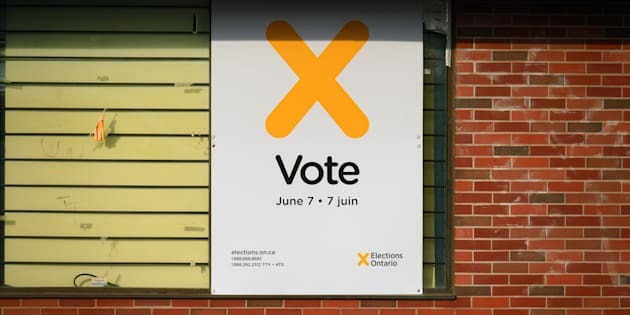 As citizens ponder candidates for provincial and municipal governments there are reminders to vote in the Ontario elections 2018 posted all over the province leading up to the June 7 elections in Kitchener, Ont., May 17, 2018. Leger executive vice-president Christian Bourque said that's a reflection of the antipathy respondents feel toward the Liberals, led by Kathleen Wynne. "You can move from right to left as long as you avoid the Liberals," Bourque said in an interview. "What I'm seeing here is that if there is still movement between now and election day — or even over the last weekend — it should favour the NDP at this point in the game." Horwath also leads handily in terms of who voters think would make the best premier. In all, 28 per cent of those asked named her, while 23 per cent — most men — said Ford. Wynne earned the nod from a mere 12 per cent. Horwath's approval rating crosses all age groups. "That's not a whopping number," Bourque said. "If you look at the Liberals, only 39 per cent feel Kathleen Wynne has led the best campaign." It's all up for grabs. "That's what they've been told since the start of the campaign — that the Ontario PCs would win," Bourque said. "It's probably fuelled the NDP vote (and) it probably takes the Liberals out of the equation." Despite Horwath's performance and her party's favoured second-choice status among supporters of the other two parties, Bourque said it is still too unpredictable to predict the New Democrats will end up in first place — at least in terms of the popular vote. "It's all up for grabs," Bourque said.